A stunning piece in itself, this unique, vintage inspired tall trestle table will draw the eye of anyone who enters the room. 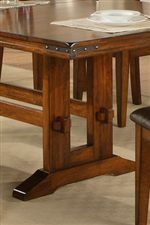 The lovely silhouette of the trestle base combine with the Cherry Tobacco finish gives this table a timeless feel. Featuring exotic hardwood construction, this table is able to withhold the wear and tear of any dinner meal and remain highly water resistant. An 18-inch leaf allows you to expand the table to accommodate guests and store away when not needed. Surrounding the table are sturdy barstools that will add to the old-world charm of dinner space. The chair features a classic yet simple design of straight legs and a horizontal double panel back. A bicast leather cushion covers the seat, offering an element of comfort as you sit down for dinner and conversation. The Mango 5 Piece Dining Set Includes Table & 4 Chairs (Bench Not Included) by Winners Only at Turk Furniture in the Joliet, La Salle, Kankakee, Plainfield, Bourbonnais, Ottawa, Danville, Bradley, Shorewood area. Product availability may vary. Contact us for the most current availability on this product. The Mango collection is a great option if you are looking for Transitional furniture in the Joliet, La Salle, Kankakee, Plainfield, Bourbonnais, Ottawa, Danville, Bradley, Shorewood area. 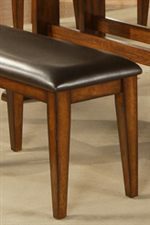 Browse other items in the Mango collection from Turk Furniture in the Joliet, La Salle, Kankakee, Plainfield, Bourbonnais, Ottawa, Danville, Bradley, Shorewood area.